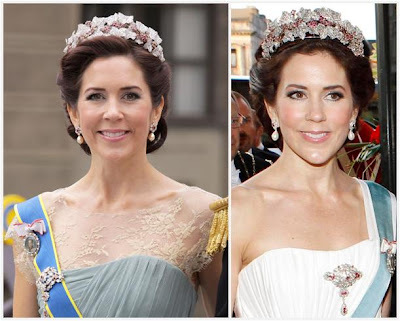 We have bemoaned the size of Crown Princess Mary's tiara collection many a time on this site. She has just two, plus the loaned Midnight Tiara, and one of them is a tiara that many find way too small for a future queen. But here's a thought: if you were to value jewel collections by the weight of their historical provenance, rather than just cumulative carats of bling or pure variety, Mary might come out farther ahead in the game than you think. Yes, her ruby parure - containing your fourth favorite tiara - carries some hefty historical weight indeed. This tiara tale begins, like many others, at the court of Napoleon Bonaparte. When planning his coronation as Emperor of the French in 1804, he wanted to ensure that it would be the grandest possible event. He went so far as to give money to his marshals so that they could buy their wives the proper amount of jewels for the occasion. One of those men, Jean Baptiste Bernadotte, bought a ruby and diamond wreath tiara and accompanying parure for his wife, Désirée Clary, and she wore it on that historical day. This couple would later become King Carl XIV Johan and Queen Desideria of Sweden, and the jewels found a new Swedish home. In the modern history of this tiara, it is so well associated with Queen Ingrid of Denmark (who was born a Princess of Sweden) that many assume it made the trip from Sweden to Denmark along with the rest of Ingrid's wedding gifts. In fact it came over much earlier, with another Swedish princess that became a Danish queen: Queen Louise, who married the future Frederick VIII in 1869. Louise received the tiara as a wedding gift from her grandmother, Queen Josephine of Sweden (Désirée's daughter-in-law), because the rubies and diamonds echoed the colors of the Danish flag. 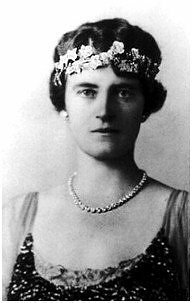 Queen Louise gave the tiara to her son Crown Prince Christian's bride Alexandrine as a wedding gift; Alexandrine would have to wait until Louise passed away to inherit the rest of the parure. It was Alexandrine that gave it to Princess Ingrid of Sweden when she married Crown Prince Frederik of Denmark in 1935. You've probably noticed by now that the pictures of the tiara in use so far look nothing like the tiara we know today (nothing slips past you! ), and you're quite right. The original version was more like a small wreath than a proper tiara, but Ingrid fixed that. In 1947, she took two of the brooches that came with the initial parure (which she can be seen wearing above) and added them to the tiara, giving it much more substance and turning it into a proper diadem that still had a lovely wreath structure from the random placement of the leaves. 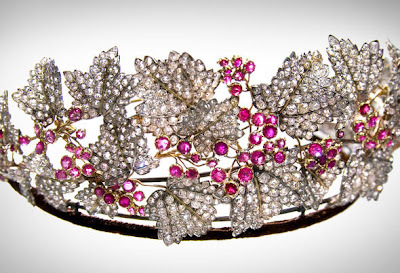 You will often see this set referred to as "Ingrid's rubies" and that makes sense: not only is she responsible for the Extreme Tiara Makeover, this was one of her signature pieces. 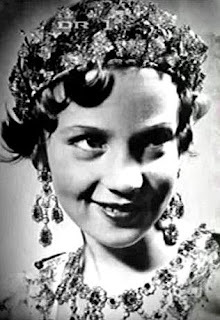 Apart from allowing her daughter Princess Benedikte to wear the parure for a play Ingrid put together on the life of Queen Desideria, Ingrid kept the rubies to herself and did not share with the other ladies in the family. The parure today includes a huge necklace, a set of earrings, a brooch, a bracelet, and a ring. 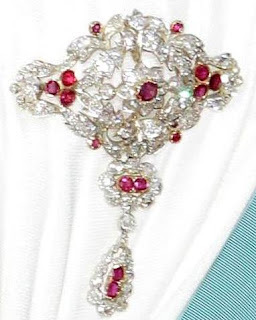 It's interesting to note in close ups that the larger rubies are actually a couple smaller rubies joining forces to make one larger piece - that's not evident from farther away. (Large rubies are rare and expensive, so it makes practical sense to set it this way.) It's also interesting to investigate the color of the rubies; they often appear pink, magenta perhaps, rather than pure red. Crown Princess Mary has made some very successful combinations of this parure with dresses in many shades of blue, and I think the pink tones help her out there. Ingrid usually wore the whole set at one time. But all together, it is enormous and possibly a bit overwhelming (certainly it must be a trial to wear!). So Mary's come up with some inventive ways to wear different pieces - the earrings can now take different pendants, she's worn the pendant of the brooch as a pendant on a necklace, that sort of thing. 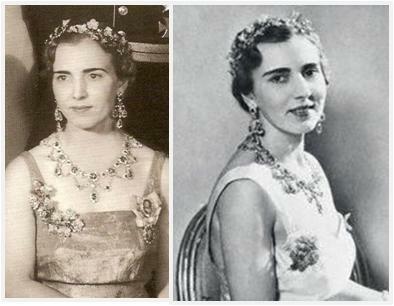 She's also taken a page out of Ingrid's book and has altered the shape of the tiara to her own taste. It's certainly not as large of a change as Ingrid made. She's rearranged the leaves, making a more compact shape, and she put it on a new frame customized to her head shape, which allows her to wear it upright more easily. The new tiara debuted in 2010. I have to say, I miss the old version. I didn't even know that I appreciated the leafy randomness of the thing until she took some of it away. That said, I know this: a girl's gotta do what a girl's gotta do. Kudos to her for making it her own and doing whatever she needs to do to make such a cumbersome (grand and gorgeous, but cumbersome) piece work for her. We still have the sparkle, no matter which version you prefer. So, do you see why I think Mary comes out farther ahead in the jewel game than it might initially appear? She might not have access to as many jewels as Crown Princess Victoria or Princess Máxima, but which other crown princess has sole custody of a tiara with this much history and this large of an accompanying parure to boot? None of them have that. And though I would never call myself a big fan of her wedding tiara, after a full review of this set, I can understand why it is what it is: it's light, it's got to be easy to wear, it's basically the polar opposite of the rubies. A sparkly view is above; for even more information and loads more glittering shots, I highly recommend you watch Part 1 of De Kongelige Juveler, where you can hear Queen Margrethe and Crown Princess Mary discuss this piece and what it means in their own words. How do you rate the rubies?